ups: Intense gameplay, good addition to the sci-fi/horror genre, great presentation. downs: Been there, done that. One thing is clear about developer id Software: their name was chosen well. They specialize in flashy, adrenaline-pumping frightfests that bypass the gamer\'s intellect and play to right to their core survival instincts. While their games are increasingly more derivative of one another, they are never boring. And although it\'s developed with a lot of help from Raven Software, longtime id compatriot, Quake 4 fits well within the id paradigm, delivering exactly what we expect, albeit with little innovation or advancement to the genre it serves so well. Quake 4 returns the series to story driven gameplay, or at least the ballpark or the general vicinity of story driven gameplay. That is to say that crash landing on the Strogg home planet and killing everything in sight is hardly more dynamic a narrative than Doom\'s conceit of stepping through a wormhole into hell. However, what the story mode lacks in narrative complexity, it more than makes up for in intensity. One of the selling points in the trailers and promotional material for the game is that your character, Kane, is captured by the Strogg and turned into one of them. This transformation is shown in graphic detail from first-person perspective. Having fought this terrible enemy face to face in a losing battle for half the game, making the player suffer this kind of visceral horror brings about a kind of humanity that is hard to deny. You can\'t help but place yourself in the role after going through something like that. The second half of the game is where the real fun is. The portion of the game played as the strictly human marine is classic horror set up, moving a little more deliberately, spreading the enemy out amongst the shadows. Here Quake 4 shows its origins in the Doom 3 engine, pushing the player through one narrow, industrialized hallway after another. Not exactly identical, it would be fair to call this game the fraternal twin of Doom 3. Unfortunately, Quake 4 just isn\'t as genuinely frightening as its predecessor, as the enemies jump out too soon, allowing you a little too much distance to get off a clean shot. And, as you can always have your flashlight on, you are never engulfed in darkness, which was the scariest part of Doom 3. Once Kane is converted into a Strogg, however, the game kicks it up a notch. You are faster and stronger than ever before, and you encounter a variety of new enemies and weapons. The gameplay is all twitch and reflex. This is one of the id franchises that helped coin the term \"fragfest,\" after all. The weapons selection is a highpoint, including assault rifles, shotguns, rocket launchers, rail guns, lightning guns, and more. Each weapon is then able to be upgraded so that, for instance, the assault rifle carries more ammo, the rocket launcher auto-loads, and the lightning gun branches out to hit more enemies. This is the kind of game that is best played on the run, tearing through levels without stopping to think. After all, the level design leads you like a lab rat through a maze, and you rarely have to worry about running out of ammo as there is always more around the corner. The game is better if you can keep the intensity at its peak, and it has the added effect of making the few breathers you are given more enjoyable, necessary even. Throughout the game you will encounter squads of marines that provide you with mission objectives and sometimes help you in battle. There are a great deal of in-game interactions and cut scenes that are meant to form a sense of camaraderie amongst the troops, but as your allies are, as usual, only minimal help in the end, there is really only one reason to keep them alive: self preservation. The medics and technicians provide a valuable service by restoring health and armor. There are also vehicle and rail shooting elements in the game to add a little variety. The vehicles consist of a hover tank and a giant mech, and are relatively easy and fun to control. The rail shooting portions of the game take place on trams and convoys, and require a little targeting skill to succeed. Ultimately, these are more of a diversion than anything, as they are not necessarily that deep or engaging, just fun for the moment. The multiplayer is nearly identical in style and content as Quake III Arena, a game that started showing its age a long time ago. Those that have played that game will recognize the jump pads, level designs, and the quick in-and-out gameplay. Games include Deathmatch, Team Deathmatch, an elimination-style Tournament, Capture the Flag, and Arena CTF. Multiplayer games can be played with up to eight players locally, by system link, or, playing to the strengths of the 360, online. It is disappointing to see the multiplayer games reduced from sixteen players on the PC to eight, especially when Perfect Dark supports thirty-two players. It is more disappointing that the series has not made any significant advancements in multiplayer gameplay in over five years. The presentation is top shelf for the most part. The graphics are beautifully rendered down to the finest of lines in 1080i HDTV. The textures and lighting effects are lavish within the confined spaces that make up most of the game. Character animation is solid. The eyes of your fellow marines track you as you walk by, and their movements are relatively natural. The outdoor levels are a bit bland, however, and the framerate has a tendency to drop at times. The sound is brilliant. 5.1 digital surround is becoming more and more necessary as games continue to evolve. At this point, I cannot imagine playing an FPS without keeping an ear out for footsteps giving away an enemy\'s position behind me, or gunfire coming at me from all sides. The voice acting is very well done. The game is filled with constant chatter as you contact new marines and eavesdrop on conversations. There are relatively few problems with the game, except that it doesn\'t really do anything new. The story mode is effective, but far from brilliant. The transformation from Marine to Strogg is particularly well done, but hardly innovative (Farcry: Instincts contains a more dynamic, albeit less emotional, transformation in terms of gameplay). 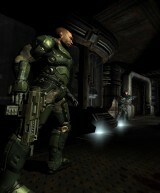 The multiplayer is nearly identical to Quake 3, and has been scaled down in Quake 4 from the PC version. And as pretty as the graphics are, I was tired of looking at rusty pipes and grated floors long before I played this game. Quake 4 does what it is expected to do, and little else. It doesn\'t even offer a co-op mode like its big brother, Doom 3, which, by the way, would have been a welcome addition to gameplay. But, for FPS fans looking for a good fragfest, and for those looking for a game that will give them a healthy dose of the creeps, Quake 4 is worth checking out. NOTE: The first three screens below are taken from the XB360 version of Quake 4, and the following screens are taken from the PC version due to circumstances beyond our control. These are meant to illustrate the action of the game.